It was another packed event this year as the 31st annual Cuvée Grand Tasting brought almost 900 guests together to celebrate excellence in the thriving Ontario wine industry. “This is the largest event of its kind and the strong turnout of guests year after year truly showcases the importance of our grape and wine industry and the strong level of support it garners from our community,” said Cuvée manager Barb Tatarnic. This year’s Cuvée Vineyard of Excellence Award went to Martin Schuele, a grape grower in Beamsville. Sponsored by BASF Canada Inc., the award recognizes a grape grower who promotes excellence in vineyard practices. “The Cuvée Grand Tasting is a great opportunity for BASF to not only celebrate Ontario wines with our grape customers, but to also introduce those customers to some of the future industry leaders from Brock University and Niagara College,” said Scott Hodgins, Crop Manager, Horticulture for BASF Canada Inc.
Cuvée also celebrates the next generation of winemakers and grape growers by providing scholarships to Brock University Oenology and Viticulture undergraduate and graduate students through the Cuvée Legacy Fund. 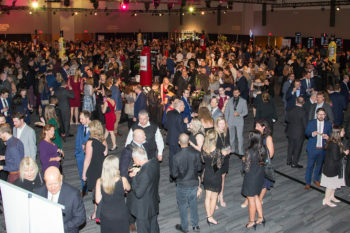 Almost 900 guests took part in the 31st annual Cuvée Grand Tasting Saturday, March 23 at the Scotiabank Convention Centre in Niagara Falls.